…and a bucket of spit? Wanna know what’s not so funny? Lying to you about the rates. Special Note: If you're in a hurry, and just want to speak to a live person (who will tell you the truth), you may skip all the reading and click here. Why do Boom Truck Finance Companies lie about the Rates? You want super low rates? You can totally get them. … you won’t get those ultra-low rates. Nobody tells you that on their websites though. We’re all stocked up on crazy pills. Companies that brag about 5% leasing rates for tree equipment. Their customers won’t qualify for that. You can start here to get an honest quote. Usually, if you’d qualify for (almost) free financing, you just get it from the dealership anyway. Are you a startup or an established business? Do you have plenty of liquid funds? Or are you flat broke? This chart shows you the low rates just like everyone else. With bad credit and limited funds… you’ll end up paying more. Do you know what the difference is in payments between a 6 percent rate and a 9 percent rate? Imagine a $20,000 bucket truck financed over 3 years. You’d pay $608 a month at 6 percent. Now, with a 9 percent “rate” you’d pay $635. The difference in payments is $27. Do you know how many business owners get robbed shopping until they find a thug willing to pretend their rates will be 6%? (Sometimes, the rates will be 6% for reals… but usually not). Someone who is fixing to tool you up can quote any rate they want. They aren’t constrained with nuisances like the truth. your payments on that same truck might go up by $100 (or more… it depends). $100 a month extra will make no difference to your business. 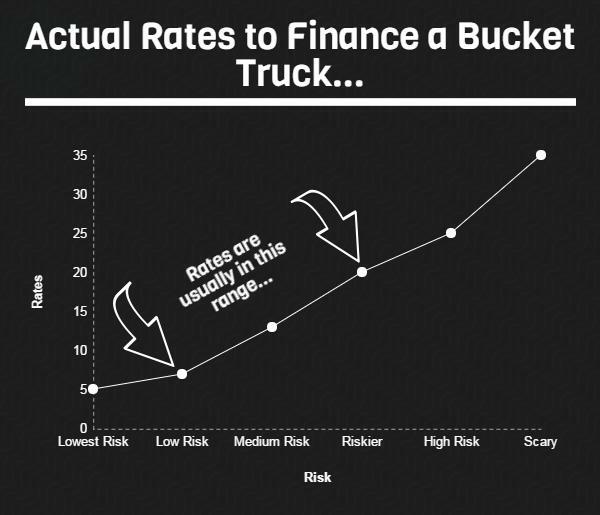 What Down Payment Will You Need for Bucket Truck Leasing? Those same guys that brag on the rates you won’t get? They usually also brag on no down payments. Zero down payment is a possibility sometimes. But if it is for your startup company with no collateral and you have a 550 credit score? In most cases, someone with at least “ok” credit can do a bucket or boom truck lease with 1 or 2 payments upfront. With poor credit, you may be asked for 20% or more as a down payment or security deposit. Find out what your down payment will be here. …and sometimes you can’t get approved at all. Can You Finance a Boom Truck With Bad Credit? That doesn’t mean approval is automatic with 600 or higher credit. A few things can throw a monkey wrench in your plans. Large tax liens, open judgments, or a recent bankruptcy can all make it much more difficult to be approved. It’s a little bit easier for established businesses. In many cases, you can be approved with a low credit score. It all depends on the situation, but if you have good cash flow, or some collateral, deals can be done. Ready to lease or finance your bucket truck? Give us a call at (866) 631-9996 or click in the picture below to get started.